Probably the best and most important question. I have thought a long time about to create my own blog. After I have made my first experiences as an author on TechNet WikiNinjas it is time for the kick-off. Like other blogs have helped me to solve problems, gain knowledge and get in contact with people the purpose of this blog is to help others. It should be a source of information and provide help for several topics and problems. Because I’m holding a lot of workshops and presentations this blog should also contain deeper explanations for subjects and samples. Stop, just for a moment! Who are you? Good point. It should be clearified, because it could be important. 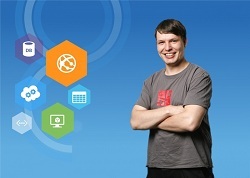 Hi, my name is Jan Hentschel and I’m a .NET developer, Microsoft Expert Student Partner, Windows 8 trainer and Windows Azure Insider. Ok! What should this blog be all about? Do you like to discuss your private life? No, I don’t like to discuss something private. This blog is all about technology. Today my focus is Windows Azure and Windows 8, but I like to write about other interesting things related to software development. Additionally, I like to discuss problems I see often in forums in a vivid way. Are you writing new blog articles weekly, daily or hourly? I would like to see a new post every day, but like it is with most things … there is not enough time and a private life is a nice thing. New articles will be published at an unregular intervals, but I try to publish something new every week. Ok, this post is in English, but I have seen some German content on your site. Why? Because I’m from Germany I also like to provide articles for the German community, but every article, where it makes sense, will be published in English, too. The best way would be to meet me in person at several events, workshops, etc. Because in some cases it is a long way to travel around the world. there is a contact form on my site. For short messages you could also reach me on Twitter (@Horizon_Net). Do you have some closing words? Have a lot of fun with my blog and I would like to hear from you through feedback and comments. This entry was posted in English on September 7, 2012 by Jan Hentschel.